The F.M. Stern Company was originally called simply Stern’s and was founded by Marcus Stern in San Jose, CA in 1851. Marcus’s son Fred inherited the business in 1905 and renamed it F.M. Stern. F.M. 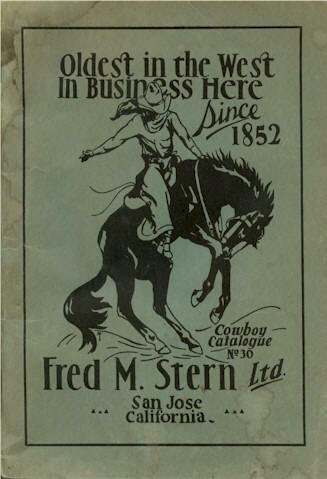 Stern was an active supplier of saddlery equipment in San Jose and sold goods sourced from many famous makers. Some of the makers who contracted with F.M. Stern included Tom Hildreth, J.J. Bernal, J.F. Echavarria, Juan Flores and Jesus Mardueño. Stern also sold bits and spurs made by Buermann as well as buying parts that would be assembled. The company was known for the fact that it only sold hand-made and high quality items and eschewed the cheaper mass-produced items found in the catalogs of many competitors. The company has been handed down through the family and is still in business in San Jose, California and goes by the name of Stern’s Travel Shop. Click here for information on F.M. Stern Maker’s Marks.